“Join us Friday, March 5th, from 6-10pm for our first ever group show at Warehouse416. 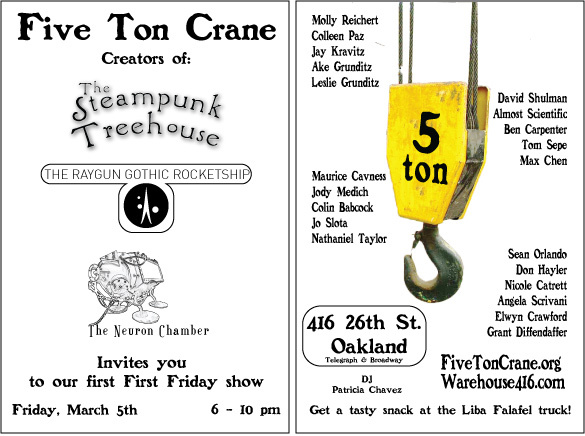 We will be displaying works from the Five Ton Crane crew, with signature pieces from The Raygun Gothic Rockethship and The Steampunk Tree House. This is our first ever public event. Please join us in celebrating the work of an amazing group of friends and artists. We’ve also got a special guest, Nicole Catrett, from The Exploratorium, showing her TiltShift-O-Scope and Strobe-O-Scopes! And if you’re hungry there will be some really delicious falafel from Liba Falafel Truck(Yummmmmmmmm). In the market for that special little octopus for that special little someone? Come and check out the unique stuffed artistry of Dorklandia.